Our growth in wisdom is a process of transformation from seed, to blossom, to harvest. True wisdom comes to you through the grace of God, the favor of the Father. We continue to grow in wisdom as we grow in His grace. In Prov. 4:9 Solomon wrote by the Spirit of God regarding wisdom, ‘she will set a garland of grace on your head.’ He spoke of our minds encircled and decorated with the presence of grace. True Godly wisdom is sown by the Father as a gift of grace, flows and grows in us as a work of grace, and brings forth a harvest as a product of grace. Our growth in wisdom is a process of transformation from seed, to blossom, to harvest. We are a planting of the Lord and growing in wisdom part of the transformation process! Paul says in Romans 12:2 to ‘be transformed by the renewing of your mind.’ The garland of grace about our heads is the wisdom of the Father coming through His favor upon our lives. We don’t work for it. We ask, receive and believe (James 1:5-8). As we do so, we grow in wisdom and the people around us began to see the ‘garland of grace’ encircling our minds. Many people wonder ‘how do I continue to live in wisdom after I receive it?’ They know they have the ‘seed of wisdom’ but aren’t sure about how to nurture it. We continue to live in wisdom as we allow the Lord to transform our minds to believe His favor in our lives; favor through the person of Jesus Christ. We must believe we are the righteousness of God, in Christ Jesus. Living in wisdom will eventually reveal a ‘garland of grace’ on your head. It comes forth as we are dependent upon the daily flow of grace--knowing we don’t deserve wisdom, but that is comes free of charge because of Jesus. The seed of wisdom is a powerful seed in our lives. 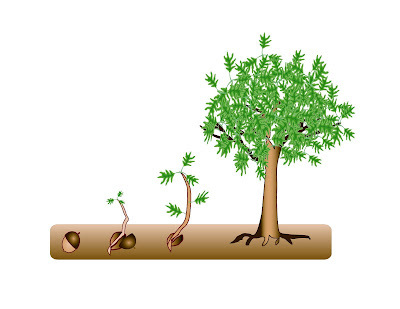 Today, look to the seed of wisdom, Jesus Christ, to continue to grow and mature to the level needed in your life. Need more wisdom? Click here to read another post on Wisdom by Harvey Wittmier.